For long, consumers have been at the mercies of cable companies with some paying hundreds of dollars per month for entertainment. This has all changed thanks to the introduction of streaming boxes and sticks filling the shelves in different electronic stores. Consumers have realized that with a good internet connection and the right streaming device, you can enjoy all the TV you want at a fraction of cable TV. However, you have to know the right device for you so that you can enjoy the full benefits that come with the streaming device. 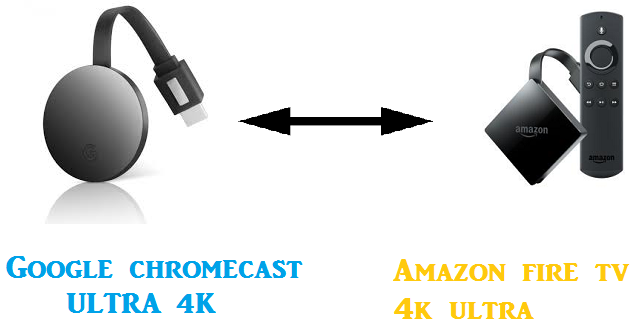 Google announced the new Chromecast Ultra in 2016 which was a new competition in the market while Amazon seriously upped their game with a huge update to the Fire TV Stick devices. Let’s take these devices head to head and see the differences between them. The two devices are dongle designed,but they take different shapes. Chromecast Ultra takes the form of a disc-shaped dongle while the Fire TV Stick is a USB shaped like a dongle. Both the devices are supposed to be plugged into the HDMI port of the TV,so the shape is not such a big deal. As seen above, there are some differences between the two. The most significant one being the video output where Chromecast comes out as the winner. This is because the Ultra supports up to 4K video resolutions and also supports HDR which allows for more vivid color in games and videos. The two devices are not so different when it comes to UI. Amazon Fire TV Stick has Android with a custom HTML5 skin. The titles are sized based on the screen you have and the list type menu which allows you to navigate from movies to search for games. Chromecast Ultra doesn’t have any specific user interface. Everything is handled and controlled using the mobile device. Chromecast is just a bridge between your TV and your mobile. The device doesn’t have a TV interface and if you didn’t have a mobile device, there is no need to buy it. It can’t allow you to watch any content or browse through for that matter. Both devices are well stocked with content but in different ways. For the Amazon Fire TV Stick, you get the TV shows and movies via Amazon Prime Video and third-party apps like Netflix, YouTube, Hulu, BBC iPlayer, CNBC, ESPN and many others. Chromecast Ultra handles everything in a different version. Since it has no TV interface, all of the content you want to view on your Chromecast Ultra is directly from your mobile device. This includes TV shows and movies as well as apps and games. There are a lot of movies and TV shows available on Google Play andthere are a large number of third-party apps that support Chromecast Ultra with a lot of good content. This is one of the huge differences between the two devices. Chromecast Ultra doesn’t have a physical remote at all. The dedicated Chromecast Ultra app and the mobile device are all the remotes you are going to get. There is also the new Google Cast app that has some cool whistles and bells. Any other app that supports Chromecast Ultra works well as a remote when you press the Cast button. The Fire TV Stick comes with a dedicated standard physical remote and also offers app-based remotes for iOS and Android too. The standard remote allows you to navigate through the user interface with the physical buttons. There is also an upgraded remote option that has voice search and builds it directly in the Fire TV Stick’s remote. The voice remote has a built-in mic and all you have to do is tap the voice button on the remote control and speak the name of the TV show or movie you want to watch. And the results will automaticallyget displayed on the screen. The Voice remote works with Amazon Video Prime and also with third-party apps like Netflix. With the Voice Remote, the Fire TV Stick is cheaper than Chromecast Ultra and it is also better because it can operate independently as compared with the Chromecast that needs other devices to connect with. However, it offers better video quality with 4K resolution and HDR support.